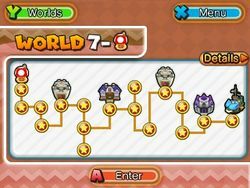 World 7 is the seventh world in Puzzle & Dragons: Super Mario Bros. Edition. 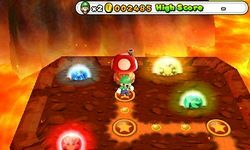 This world takes place in a volcano, resembling that of World 8 from New Super Mario Bros. Wii, using the world's music from that game. Like other worlds in the game, Orbs are scattered about the map. This world consists of sixteen levels and a Toad House. Ludwig von Koopa is the boss of this world and is fought in his castle and airship. Clearing World 7- unlocks Purple Yoshi, World 7- unlocks Yellow Yoshi, and clearing World 7- unlocks Bee Mario and Bee Luigi as Leaders. A more difficult version of World 7 exists as a Special World: ★World 7. For a listing of course maps in World 7, see here. To reach the secret exit in this course, the player must first reach the branching path (where there is a signpost and a yellow Warp Pipe). Upon reaching the branching path, the player may notice a Gold Block in the center, between the Warp Pipe and the sign. In order to trigger the block, the player needs to clear more Wood Orbs than both Light and Fire Orbs. However, the course does not contain any Wood Orbs, so the player needs to bring an ally that can create them. Upon defeating the boss at the end of the secret path, the player unlocks World 7-6. To reach the secret exit in this course, the player must first reach the branching path (where there is a signpost and a green Warp Pipe). The player must clear more Wood Orbs than Fire Orbs. The course does not contain any Wood Orbs, however, so the player needs to bring an ally that can create them. Taking the green Warp Pipe and going through the area, the player finds another branching path. The player must clear more Water Orbs than Light Orbs to follow the path with the signpost. Upon defeating the boss at the end of the secret path, the player unlocks World 7-8. This page was last edited on April 8, 2019, at 01:06.